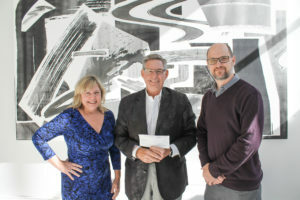 Thelma Sadoff Center for the Arts (THELMA) announced today that it received a $10,000 grant from the Oberreich Foundation to support Studio 51. Studio 51 is the name of THELMA’s arts classes held most Saturdays from Noon to 2 pm. Every week the class focuses on a different art form. Studio 51 classes are designed to provide students of all ages with inventive art instruction through a creative and stimulating environment that expands their imagination and sense of self. Students will experience art in a direct, focused and encouraging atmosphere while creating unique artworks that they can share with the rest of the world. Upcoming classes include Comic Book Character Development, Story Building and Inking and Coloring. The Oberreich Foundation provides grants to non-profit organizations that support strong cohesive families by assisting in educational and recreational programs. The private foundation was established by Francis and Ruth Oberreich of Fond du Lac. Studio 51 classes start at $15, however, scholarships are available for any child whose family may not have the means to pay. A scholarship recipient would be able to attend any Studio 51 classes for free.